By Chris Williams: Despite Manny Pacquiao coming into the ring to accept IBF welterweight champion Errol Spence Jr’s challenge last Saturday night for a unification fight, the match isn’t expected to happen, according to Mike Coppinger. Instead of those two facing each other, Pacquiao could be facing WBA Super World welterweight champion Keith ‘One Time’ Thurman (28-0, 22 KOs) or Danny Garcia (34-2, 20 KOs) next, while Spence vs. WBC 147 lb champion Shawn Porter is possible. The boxing fans will obviously be disappointed at not seeing Spence vs. Pacquiao, but not as many as you would think. Pacquiao isn’t the big name he used to be, and Spence can gain a lot by taking Porter’s scalp and then facing the Thurman-Pacquiao winner. Pacquiao not taking the fight with Spence won’t be a surprise to the fans. When Pacquiao was being challenged by Spence inside the ring last Saturday night, Pacquiao had the look of someone that wanted no part of that fight. It was like Pacquiao was given a big plate of porridge that he didn’t want to eat. Just reading Pacquiao’s body language, it was perfectly obvious that he doesn’t want to take the fight with Spence. As such, it’s not going to make for a good fight if is demotivated about facing Spence. This could set up a mini-tournament at welterweight if Pacquiao faces Thurman, and Spence battles Porter. The two winner of those two fights could face each other. Then you would have the consolation bracket with the losers of those two fights fighting. Danny Garcia would be better off being matched against Yordenis Ugas in order to find out whether he’s got the talent to hang at 147. When the smoke clears from this mini-tournament, the winner could possibly face WBO welterweight champion Terence Crawford, as long his promoter Bob Arum of Top Rank Boxing is open to that. If Arum wants to keep Crawford out of the tournament, then he’ll end up like light welterweight Jose Ramirez and super middleweight Gilberto Ramirez, both of which are promoted by Top Rank, in sitting out the action and watching tournaments take place without them. If Arum chooses to protect Crawford by keeping him away from the likes of Spence, Thurman and Porter, then his popularity will suffer. Crawford won’t go far with him being matched against weaker opposition. Crawford needs to speak up and insist that he get a shot against the winner of these fights. Pacquiao could surprise fans by going ahead and taking the fight with Spence anyway. It’s doubtful though. 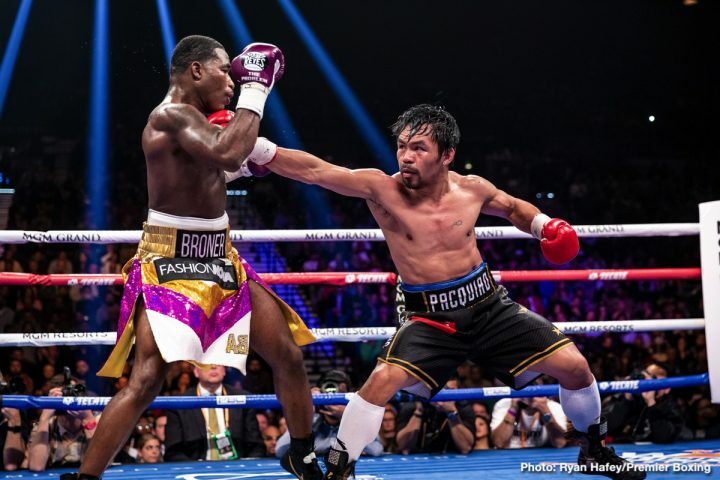 Pacquiao didn’t look at all interested in fighting Spence when the two were inside the ring together last Saturday after Spence’s lopsided 12 round unanimous decision win over Mikey Garcia at the AT&T Stadium in Arlington, Texas. Pacquiao fighting Thurman instead of Spence would be forgivable, but probably not Pacquiao fighting Danny Garcia, who has lost 2 out of his 3 fights. Pacquiao-Garcia would be seen as a cherry pick on Pacquiao’s part in the eyes of the boxing world. Danny is a good fighter, but there’s no ignoring the fact that he was recently beaten by Shawn Porter and Keith Thurman. Garcia’s only win in the last 2 1/2 years is a ninth round knockout over Brandon ‘Bam Bam’ Rios in February of 2018. A lot of boxing fans have started calling Garcia “Cherry Garcia” after hearing the news of him facing Adrian Granados (20-6-2, 14 KOs) next month on April 20. There’s nothing wrong with Pacquiao, 40, taking on Thurman rather than Spence. There will be few boxing fans complaining at Pacquiao fighting Thurman instead of Spence. Pacquiao-Thurman is still an excellent fight, and one makes a lot of sense. The World Boxing Association has two champions at welterweight, Thurman and and Pacquiao. Thurman holds the upper level WBA title. By Pacquiao facing Thurman, it would temporarily remove one of the WBA champions. Of course, the WBA will likely turn around and have the WBA ‘regular’ strap be vacant for other fighters to compete for. But at least temporarily there will be one champion with the WBA at welterweight once Pacquiao and Thurman face each other. Thurman used to be considered the best welterweight in the division 2 1/2 years ago, but his long break from boxing due to injuries has take a big hit out of his popularity as well as his physical skills. Thurman looked almost shot in his last fight against Josesito Lopez. Thurman won the fight, but he was badly hurt in the 7th and he looked poor throughout. The way Thurman fought, he might be food for Pacquiao. In 2017, Thurman would have likely beaten Pacquiao, but not anymore. As far as Spence fighting WBC champion Shawn Porter, we don’t know if Porter would agree to that fight. Porter was talking about wanting to fight the winner of the Spence vs. Mikey Garcia fight before the contest last Saturday night, but after Spence won, Porter went quiet all of a sudden. What does that mean? One can interpret Porter’s silence as an indication that he never wanted to fight Spence in the first place, and he was just hoping that Mikey would get lucky and get the ‘W’ over Spence, so that he could challenge him in a winnable fight. It won’t be surprising if Porter turns down the Spence fight. It’s unclear what excuse Porter would give for turning it down, but he can say almost anything to get out of. Pacquiao could ruin Thurman’s career if he blitzes him the way he did Lucas Matthysse. Thurman might go back up on that mountain and start playing his flute again, and never come back down again to resume his career. Losing to Spence or Crawford wouldn’t be the end of the world for Thurman, since those guys are both young and in the prime of their careers. But a loss for Thurman against 40-year-old Pacquiao is going to lose really bad, as he’s lost a lot from his game, and isn’t the same fighter that dominated from 2008 to 2012.